There once was a young married couple named Jim and Della Dellingham. They were very much in love and they were very poor. For Christmas, Della wanted to buy her husband a chain (a long, flexible piece made of many small metal parts connected at one end, one to the next, like a necklace) for this pocket watch (an old-fashioned watch worn in a pocket, not on the arm), a watch that his father had given him and that he cherished (loved very much). The trouble was, Della didn’t have enough money. The only thing she had that was valuable was her beautiful long hair. She decided to cut it off and sell it to a wig-maker (maker of fake hair) to get the money for the watch chain. Jim Dellingham loved his young wife very much and wanted to give her something special for Christmas. He, too, had little money and certainly not enough money to buy a set of beautiful combs for Della’s long hair, hair that everyone admired. In the end, Jim decided to sell his much-loved pocket watch to buy Della the combs. As you can imagine, when Christmas day arrived and the gifts were exchanged, Jim and Della were surprised and also disappointed that the gift that each had bought the other was now useless. However, they each realized the self-sacrifice (giving of oneself so another person could benefit) of the other and loved each other all the more. Why is this story called “The Gift of the Magi”? Here is O. Henry’s explanation from the last paragraph of his story. You can read O. Henry’s entire story here. I hope that your gift-giving experiences this holiday season are full of joy, for you and the ones you love. Merry Christmas. I want to talk the gift which I give to my girlfriend for Christmas. My girlfriend often says she is cold in winter and numb of her hand and leg. Therefore, I have chosen a small heat tie can be pasted on the belly. Tomorrow, she will receive the gift. I hope she will like it. Cuca and me know the story quite good and we like it so much, it seems very real when you love the way they did and you don´t think about yourself nothing, only in the person you love and it is better to give him/her all you can than to receive anything. Please, enjoy these days and give the best you can to the people near you, that should be very nice to them but better to ourselves. Thanks for this wonderful story. I found it delicious, specially because the full love showed by the couple. Here in Spain we celebrate long time ago this festivity (Magi), though nowadays the Santa Claus – or Papa Nöel, which we usually use more often – is every year beating little by little the three wonderful “wise” kings. The fact is the everyone of us could give, and show our special people how much we love, specially the children. They are, without doubt the authentic wise-king of the Christmas. Happy Christmas and new year too to everybody. I hope the best Chrismast eve an Nativity for everybody who listen to ESLPOD´s team, specially for Jeff and Lucy. Really Thanks for help me to improve my english with sense of humour. 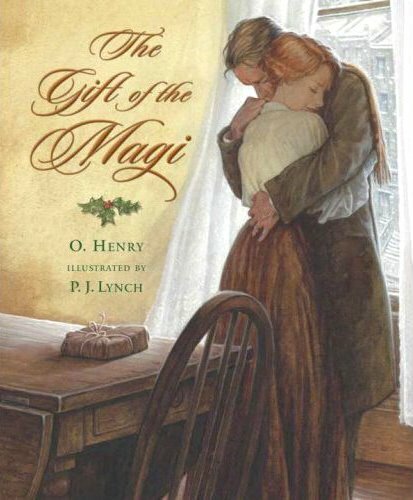 The gift of the Magi is a nice story. Giving a present is easy. For that you just must go to the shop and leave some money. But to do that that present to be a good gift is a little, or rather, very difficult. I confess that I am in the first group. Maybe will be because I’m a very practique person, or perhaps I’m a person who have very little imagination (at least I think I’m this way), however, It don’t meant that I don’t mind people whom I give them some ‘tacky’ gift. I know that many people are in the same group, but they don’t recognize this fact. I also know other people, that they really are at the second group. One of they is my older son. In fact is the number one in this matter. I know. It is really curious that I am in one extreme and my son is in the extreme oposite. In the last Augost, he gave a gift to his girlfriend that It started a few month before with a game betwen them. He gave her an instruccions into an envelope, and she must follow them until she discovers the little gift, like a dinner at the beach, or a visit some place nearby that she likes, etc…. He gave her an envelopee once in a while. This was just an innocent game for she, but in fact was the preamble to a great gift It would arrive in the last envelope. I wish a Merry Christmas and a Happy New Year to all people. Thanks a million for the best of gift -the gift of knowledge- you have been providing us every day over and over for God knows how long.And, I am painfully ashamed to admit that wishing a happy Christmas is the only thing I can bless you with. I would like to congratulate cordially to Elcomandant of his son’s invention of creating love. His story is a complete screenplay! It is very suitable to present times. I have learnt much about the love this year, more than in all my life before. I have acknowledged that the first sight is very important – you should be struck with her view, I think. It gives you wings. But, if that feeling has to develop and reinforce, some other circumstances should be fulfilled – first of all you and she should take part in exciting events – the stronger emotions, the stronger tightness in-between the couple and the bigger happiness of the relationship. It is not decisive, whether such events happen by themselves or you help them to happen – they engage the couple in both cases. So, you can create your love.